The index page, index.html, is the starting page of the documentation describing the Web service interface. This page takes one of two forms, depending on whether the WSDL file defines a single service or multiple services. The page for a single-service Web service includes the port types and data types for that service. The page for a multi-service Web service links to individual Service pages that provide this information separately for each service. Whether on a single page or multiple pages, they provide the information listed in Table 28. 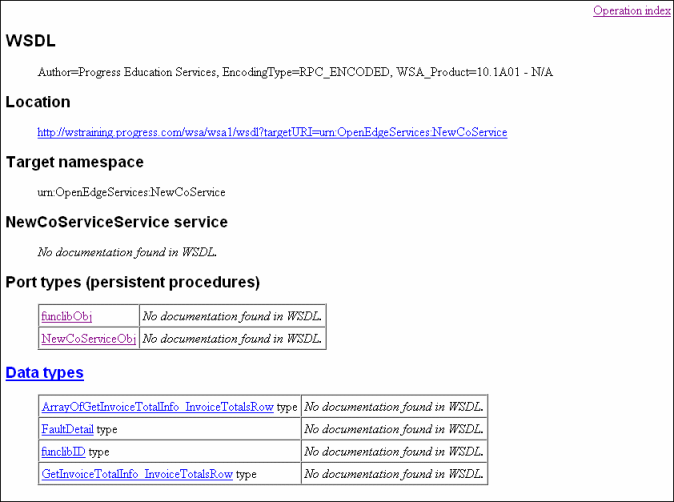 The following figure shows an example of an index page for a WSDL containing only one service. The following figure shows an example of a service page for one of the services shown in Figure 2.